It baffles me that little creeps keep hacking into huge Federal computer systems just to show they CAN, and I am speaking more as a citizen here and not as an IT expert. But when 95% of all email sent across the web is spam, and when any punk with no life and no future can get inside and steal gobs of credit and identity data with relative ease, brother, this system is dreadfully broken. "Hackers broke into the Federal Aviation Administration's computer system last week, accessing the names and Social Security numbers of 45,000 employees and retirees. The agency said in a statement Monday that two of the 48 files on the breached computer server contained personal information about employees and retires who were on the FAA's rolls as of the first week of February 2006. The server that was accessed was not connected to the operation of the air traffic control system and there is no indication those systems have been compromised, the statement said." "News of the security breach is bad enough. It’s a sickening feeling for FAA employees that we represent; employees who have suffered mightily under this rogue FAA management team for many years now. What’s worse is that this breach was preventable. The FAA was reckless and negligent in the creation of its electronic personnel file system and then showed a blatant disregard for its employees’ interests by refusing to listen to our concerns about the security of the electronic information or meet with NATCA to bargain over the impact and implementation of electronic security and files." 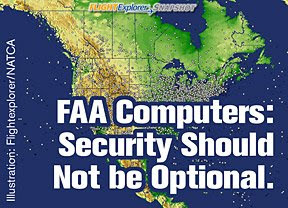 “In 2005, we brought up the issue of data security during our controller contract negotiations with the FAA. We specifically proposed at the table a contract article that stated, ‘The agency shall protect all bargaining unit employees and their data from becoming victims of identity theft and criminal mischief.’ The FAA responded by saying that language was non-negotiable, believing that they didn’t have to entertain that proposal." O.K., THIS TIME, the puke little hackers didn't get all the way into the ATC system that NATCA's controllers use to keep so many pressurized tubes full of souls from trading paint. Had the little bastards managed that, we can only imagine what disasters they could have caused. And what if these people were, oh, I don't know...evil doers? Even Mr. Obvious knows that screwing with the ATC system computers would be a far easier way to cause massive death and destruction than working around the complexities of hijacking airliners. Will 2009 be the year when NATCA gets a labor contract that is fair, and people with the right skills replace Bush-appointed cronies at FAA? 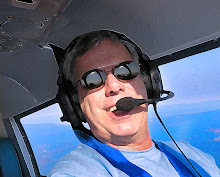 If the House Aviation Subcommittee's proposed legislation authorizing nearly $70 billion for the FAA for four years passes as it should, like so many nightmares of the last eight years, we can not only rearrange the deck chairs at FAA, we can actually right the ship.